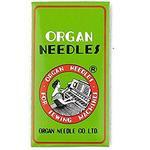 "Absolutely best selection of sewing machine needles anywhere!!" Jean R, Facebook Gerrnan made Schmetz needle recommendations started with European manufacturers Viking, Pfaff, Bernina and Elna which included Schmetz needle packs in their European made machines, which are getting fewer every year.. 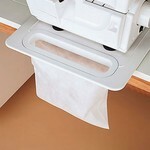 Problem is, no serger, blindstitch or coverhem home machines have ever been made in Europe, only Asia! 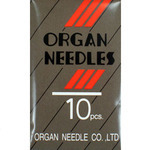 Asian manufacturers generally include Organ needles made in Japan with or in their machines. European brands instruction books may still recommend Schmetz, but their Asian contract manufacturing plants mostly include Organ needles in their machines. We have learned that machines sew better when we use Schmetz in European made machines, Organ for Asia made and Brazil for Singer made, which is also what they are timed with at those factories. 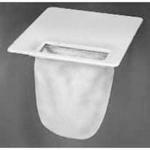 You can safely substitute Schmetz for Organ, but you would pay twice as much for their specialty needles in sergers, blindhem and covenhem machines made in Asia. What does needle size #90 mean? The number classification of a needle refers to the diameter of the blade (#90 means .9mm in diameter). The larger the number, the larger the needle's diameter of the blade. 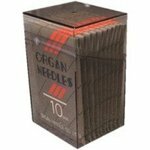 Larger needles also have a larger eye making them ideal for thicker threads. If a thread moves through an eye that is too small for the diameter of the thread, the thread may heat up, skip stitches, shred or break. Babylock Sergers come with Organ Brand Serger Needles from the factory, so there should not be any issue with using Organ HAx1SP serger needles in Babylocks or any other portable home serger that uses flatback HAx1 needle systems.